Well, I have a basket full of laundry sitting on the sofa that needs to be folded. There are clean dishes on the counter that need to be put away. Taxes are due soon. And I could probably be checking several other items off of my to-do list. But here's the rub: the birds are chirping, the sun is shining, and it is warm outside. My to-do list just can't compete with that. And besides, it will all still be there in an hour or two, right? As a good Minnesota girl, I am a fan of snow (yes, even in March) but I'm not sure anyone can complain about t-shirt and sandals weather in early Spring. There is nothing that can compare to the feeling of vitamin D rejuvenating your entire body. Just as warmth in the beginning of Spring awakens the soul, a change in food can do the same. After a winter full of heavy food like stews, roasts, and countless baked goods, it feels nice to enjoy fresh, light food. Now, please understand that when I say "light" I don't mean so light that you're hungrier after you finish your meal than you were before it started. No. I'm not that kind of girl. I need to feel satisfied, otherwise I start giving into things like handfuls of chocolate chips and scoops of peanut butter. Together. On a spoon. Ohmygosh. This roasted broccoli salad is absolutely perfect for a light but fulfilling lunch. It has tons of flavor, great textures, and it is pretty hands-off which makes it great for busy moms like me or even for working folks looking for an easy lunches to make ahead for the week. If you're vegetarian, or even vegan if you remove or replace the mozzarella , this is a great meal option as well. The broccoli gives a nice meatiness and with some pine nuts or walnuts sprinkled on top, you've got a perfect entrée! 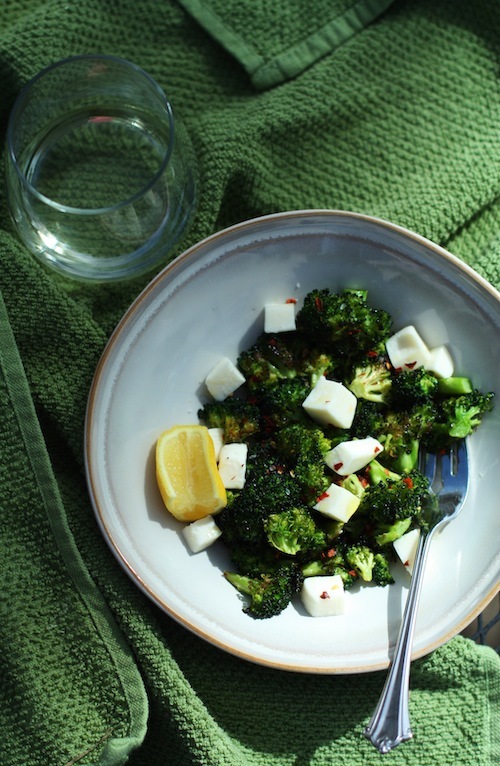 In a large bowl, toss the broccoli with the olive oil and salt. Spread in an even layer on a baking sheet and place on the middle rack of the oven. Roast the broccoli for 10-12 minutes or until lightly browned and crispy in spots. Put the broccoli in a serving bowl and drizzle with the lemon juice. Then top the salad with the mozzarella cubes and sprinkle with the red pepper flakes. Season with additional salt if necessary. Serve immediately. * If you would like to make this ahead, allow the broccoli to cool before adding the cheese. Then, store the salad in the refrigerator and eat cold- it's just as delicious!